Fancy the chance of winning some Limited Edition goodies? Well, keep on reading to find out how to enter my whimsical makeup giveaway below. I haven’t hosted my own giveaway in months now and figured it was the perfect time to do so… If you are the lucky winner you will receive some of the Limited Edition pieces I’ve been loving for summer. Could the Jouer Mermaid Collection be any prettier? I mean just look at that packaging and the stunning shades of the offer! 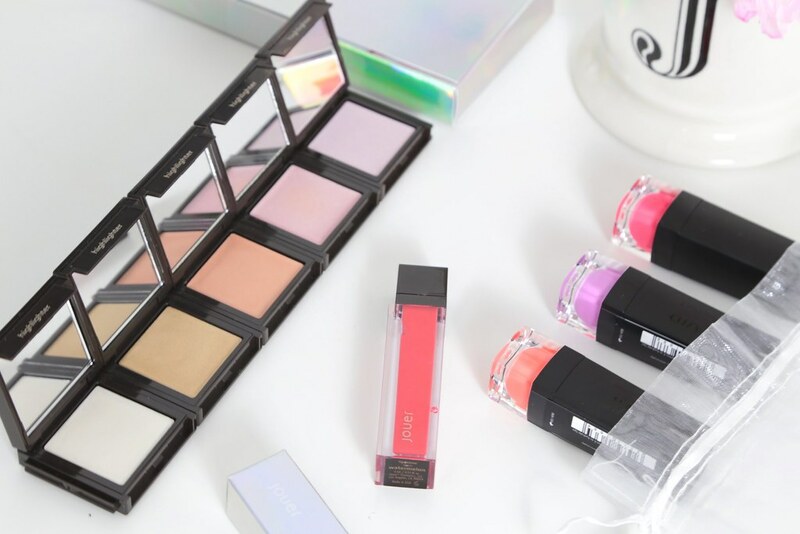 The metallic packaging really get’s this collection off to a good start for summer and I’ve loved everything from the collection but still eager to try the lip topper (once it comes back in stock that is). I’ve picked two must haves for this giveaway that you need in your makeup bag/drawer this summer! The stunning Jouer Mermaid Glow Palette and true red matte Watermelon Liquid Lip Creme. The watermelon lip creme is stunning and a must have for any makeup enthusiast with it’s classic true red matte finish. What’s unique about this formula is the fact it applies to a liquid then sets into the matte for a beautiful finish that lasts all day (And I mean all day!!). We then have the ultimate Jouer Glow Palette for that stunning summer glow. These would make for the perfect addition to your makeup and the cute sized packaging is easy for travelling with and storing away when unclipping each block palette. Next up a stunning vary of bright blushes from the Limited Edition SleekMAKEUP Whimsical Collection that applies like a cream for a pretty dewy finish. These are fun and perfect for the weekends or nights out as each shade is bold and adds some playfulness to your makeup. Lastly, we have the Sleek Lipsticks, also from the Whimsical Collection. These are semi-matte and you can see a full review of the original VIP lipsticks here for an idea of the formula and what to expect. Again these are bolder shades and brighter than your average lipstick so perfect for playing around with or as part of a creative makeup look for the weekend. I hope you love everything included as much as I do and the theme of this giveaway for summer. Everything pictured will be included as the prize for one lucky winner in a pretty metallic organza bag to complete the theme. "How To Style The Lace Skater Dress"
This giveaway looks amazing, entered a few times and crossing everything I’ve got! Great giveaway! Love your beautiful pictures. What a great giveaway, Jenny! Love these products! What a wonderful Giveaway! Wish everybody luck! So many pretty colors! Love it. This looks great!! I love the shades! Some really lovely products here, I really am in love with Sleek so I will definitely need to try out these limited edition products soon! Aaahh thank you for such an amazing, generous giveaway! <3 That Jouer palette looks beautiful!